Québec Alert Ready is a system that enables Ministère de la Sécurité publique (MSP) to quickly alert Quebecers to events posing a real or imminent threat to their lives or safety. Public warning messages provide valuable information to minimize the likely impact of these emergencies and advise people on how to respond as the situation develops. Québec Alert Ready is the Québec component of Canada’s national public warning system Alert Ready, a countrywide initiative developed in partnership by provincial, territorial, and federal emergency management officials, Environment Canada, and the broadcasting and telecommunications industry. Responsibility for broadcasting public warning messages is shared between the provincial, territorial, and federal governments, and Canada’s broadcasting and telecommunications companies. Municipalities already have measures in place to keep people informed in the event of emergencies such as natural disasters, and this system helps them communicate even better. 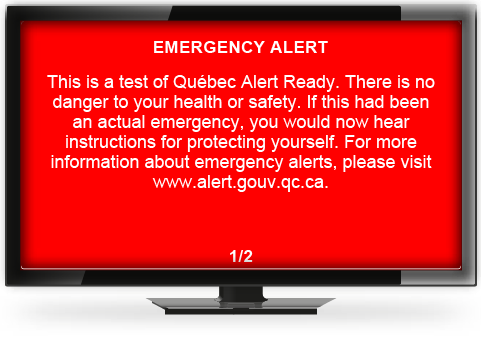 Ministère de la Sécurité publique (MSP) is responsible for broadcasting official public alerts to Quebecers through Québec Alert Ready. These messages warn of events that could put people at risk or endanger their lives. Environment and Climate Change Canada also has a mandate to issue public warnings about dangerous weather conditions that might strike Québec, such as tornadoes. The Sûreté du Québec and the Service de Police de la Ville de Montréal have the authority to trigger a Québec-wide Amber alert. All Amber alerts are relayed by MSP via Québec Alert Ready. Pelmorex Communications Inc. was designated by the CRTC to develop the platform that enables MSP to broadcast emergency messages.Find out more..
Broadcasting and telecommunications companies play an important role in the smooth operation of the public alerting system, as they must ensure they’re connected and ready to relay the emergency warnings issued by MSP. The CRTC is an independent public authority in charge of regulating and supervising Canadian broadcasting and telecommunications. Find out more. In August 2014, the CRTC made it mandatory for all radio and television broadcasters and cable and satellite companies to distribute critical alerts issued through Pelmorex Communications Inc.’s Alert Ready system. See Broadcasting Order 2014-444. In a bid to standardize public alerts issued across the country, a pan-Canadian working group of officials developed Common Look and Feel Guidance for broadcasters, also known as last mile distributors (LMDs). The sound or look of an alert may differ from the examples below, due to technical or technological constraints. If you think that content is inadequately presented, please notify your service provider or the broadcaster concerned. LMDs must emit an audio signal announcing the broadcast of an emergency alert. The purpose of this sound is to clearly differentiate between alerts issued in the United States and those issued in Canada. Listen to the Canadian Alerting Attention Signal. Where possible, media broadcasters must present the warning message in white text against a red background, either as a full screen notice or as a crawler section at the bottom. Text must be large enough for viewers to read easily. It is currently possible to receive emergency warnings through the MétéoMédia mobile app. The CRTC held public consultations in March 2016 to find out what people thought of participation by wireless service providers in the National Public Alerting System (Telecom Notice of Consultation CRTC 2016-115). In the wake of the consultation, the CRTC will decide whether to make it mandatory for wireless service providers to distribute emergency alerts.